On 14 of May 1948 – Israel declared unilaterally her independence in a foreign land, called Palestine, supported by a UN Resolution sponsored by the UK (the United Nations “Partition Plan of Palestine” at the end of the British Mandate (euphemism for British ‘colony’), was adopted by the UN General Assembly on 29 November 1947 as Resolution 181 II). 1948 was also the year of the UN’s Universal Declaration of Human Rights – this year, 2018, the UN declared Human Rights are, like Israel, celebrating their 70th Birthday(United Nations General Assembly, Paris, 10 December 1948 – General Assembly Resolution 217 A).During 70 years of Human Rights, the UN has tacitly allowed Israel’s ethnic cleansing of Palestinians, who lived in their own land, Palestine. 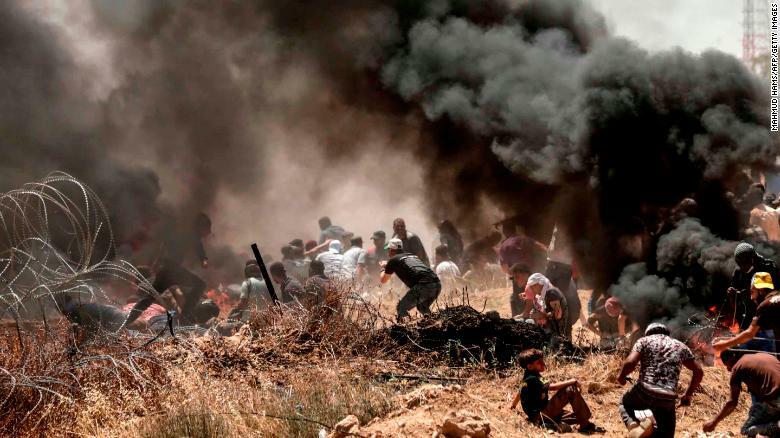 The UN has allowed Israel’s massacre of Palestine against dozens of UN Resolution to restrain Israel from their aggressions on Palestine, killing tens of thousands of unarmed Palestinians, women, children and men. Destroying their livelihood, schools, hospitals andliving quarters. Worse, confining 2 million Palestinians in an open torture and terror camp, called Gaza. It is a shame. Israel is a miserable and criminal disgrace – but a worse shame is the United Nations, the collectivity of 193 countries who collectively hide behind the mantle of the UN. Those who have dared to protest in the defense of human rights and in defense of Palestinians’ self-determination are few and far in between, risking the sword of the emperor and his poodles. Most have bent to and are still bending to – the king bull, Washington – and to its master, Israel. This is what is lamentable, that humanity has become a spineless bunch of nations – all kneeling in front of the big Satan, the torturing and killing monster, the US-armed to the teeth killing machine – the little dog that counts on the unlimited support from the most horrific bulldozer. That is anatrocious and unspeakable shame. – At least one honorable country, South Africa, has expelled Israel’s Ambassador over these most recent bloody atrocities. When Trump in December 2017 declared that the US will transfer her Embassy to Jerusalem, he endorsed just once more a promise made over the last 30 years by several US Presidents, from the Bush dynasty to Clinton to Obama – but none of them implemented that promise, lest it would undermine peace negotiations. These promises by Washington were, of course, full of hypocrisy, as Washington always knew that peace was not on the table, that neither Israel or Washington were in favor of peace. Peace would have meant, as per the 1993 Oslo Accord, a two-state solution, meaning Israel and Palestine would live side-by-side in peace; two sovereign nations with equal rights. Well, Trump, has made his campaign promise true. He – ordered by his darkest handlers – has cut the hypocrisy, using Israel’s 70th Birthday, 14 May 2018 to make Israel’s obsessive and oppressive dream come true, officially inaugurating the US Embassy in Jerusalem – to the detriment of peace and the total destitution of Palestine. The Oslo Accords saw Jerusalem as the final jewel in the mosaic for peace in a two-state solution – the Capital of both Palestine and Israel. What happened on 14 May 2018 in Palestine, those who are behind the apartheid, ethnic cleansing and outright Holocaust Israel has imposed on Palestine during the last 70 years, belong, no doubt, before a Nuremberg-type tribunal – with sentences as harsh as those inflicted by the allies after WWII on the Nazis and their Holocaust. Likewise have all the related UN agencies been corrupted and swayed to favor the Exceptional Nation and the Chosen People. There is no way that the International Courts of The Hague would ever prosecute a war crime committed by the west, let alone by the west’s chief criminals, the US and Israel. It’s simply not going to happen. Not while the current power structures are in place. Why then even believe in this fake justice system? And who still dares quoting them as beacons of international justice? – This is a farce, if there has ever been one. The latter is gradually fading, as nations are aware of their vulnerability by sticking to the US dollar. Many are now dealing directly in their own currencies, trying to circumvent the US monetary control. But that recognition, again, is weakened itself by the fear of sanctions, or condemnation by US courts which have in fact absolutely no jurisdiction in another sovereign land. But, since under the current western Ponzi fiat scheme all financial transactions have to flow through a US bank either in New York or London, potential non-adherence to the rule is “punishable”, and that mostly by economic strangulation, regime change or death. – It’s a vicious circle, under which Human Rights are just a slogan and a farce; and under which the rights of sovereign nations, for example of Palestine, remain not more than a pipe dream. The combined neoliberal onslaught with impunity from all sides reaches a level of increasing awareness and rejection; the fearlessness of diabolical actions by neofascist governments is about to cause an awakening, a consciousness that dares to say – enough is enough. Take France’s Macron’s labor reforms – since February this year France has been plagued by strikes no-end – and no end is in sight. This is the worst – or the best – France has known since the 1968 student up-raisings. France, under Macron, the Rothchild-implant, is also the most militarized country in Europe. The European Union – at least for now – and since Washington’s stepping out from Iran’s Nuclear Deal, is distinctly distancing herself from the extremist, unfettered neoliberal politics of Washington. It’s perhaps too soon to call Victory – but this abject, unjustified and criminal slaughter of Palestinians, of another blow of violent oppression of Palestine (there is no word that can properly describe what happened on 14 May 2018), may signal that the monster vessel on high sea is losing notch-by-little-notch its diabolical North.